The tri-band Nokia 6080 presents a stylish and compact camera phone at an affordable price point, and is primarily targeted to consumers in Asia. In an elegant black design, highlighted with silver or gold colour accents, this camera phone combines camera and video recorder capabilities with a stereo FM radio. 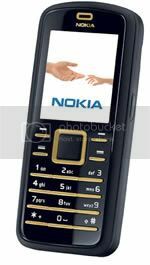 The large colour display and illuminated keypad layout, combined with the intuitive and well-known Nokia Series 40 user interface, make the Nokia 6080 an easy-to-use companion for daily life. For fun and entertainment, the Nokia 6080 features a stereo FM radio and MP3 ring tones, complemented by a stereo headset included in the sales package. Adding a touch of personal style, the phone can be personalized with wallpapers, themes and even a Sudoku game, especially designed for the Nokia 6080. The elegant new handset also features a blinking light effect to indicate a missed call or a received message. To stay in touch with family and friends, the Nokia 6080 offers comprehensive functions for easy messaging and voice communication, including MMS, Nokia Xpress audio messaging, email and push to talk. Browsing for news and uploading images and videos is convenient with the phone’s XHTML browser and fast data connections through EDGE. Weighing 91 grams, the Nokia 6080 offers a talk time of up to 3.5 hours and a standby time of up to 12 days, and will be available in stylish black, gold and silver colour variants.